The activation of factor XI by factor XIIa is illustrated. Although factor XI can bind independently to negatively charged surfaces, proteolysis by factor XIIa can only occur in the presence of surface- bound high molecular weight kininogen (HMWKa). The bound HMWKa is susceptible to proteolysis by the newly generated factor XIa which results in a loss of its biological activity (HMWKi). Factor XIa catalyzes the proteolytic conversion of factor IX to factor IXa either in solution phase or when bound to a negatively charged surface. Proteolysis of XI by factor XIIa in the presence of high molecular weight kininogen (HMWK), yields the enzyme factor XIa (1-3). 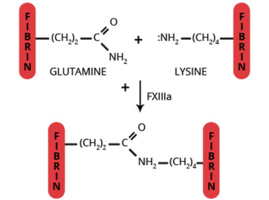 Factor XIa is a serine protease which participates in the intrinsic pathway of coagulation by catalyzing the conversion of factor IX to factor IXa. Because factor XI is a homodimer, the enzyme, factor XIa, is composed of two identical heavy chains (Mr=50,000), and two identical light chains (Mr=30,000), all of which are held together by disulfide bonds. This latter property makes factor XIa unique among the serine proteases, since it contains two active sites per molecule (1-3). Factor XIa, like its precursor factor XI, remains in complex with HMWK (4). In complex form, factor XIa/HMWK is capable of activating factor XII to factor XIIa and prekallikrein to kallikrein. Additionally, in the complexed form, factor XIa is less affected by protease inhibitors (5). The major plasma inhibitor of factor XIa is a1-antitrypsin and then to a much lesser extent, antithrombin-III (5,6). While in the complexed form, factor XIa may catalyze the proteolysis of HMWK, yielding a biologically inactive form of HMWK (HMWKi), thus allowing dissociation of the Factor XIa/HMWKi complex. Either free factor XIa or the factor XIa/HMWK complex catalyzes the proteolytic conversion of factor IX to factor IXa. Factor XIa is prepared by activating purified factor XI with factor XIIa. Following activation, the mixture is passed over a column of immobilized anti-factor XII to remove the factor XIIa, and further purified on heparin-Sepharose. The factor XIa is supplied in 50% (vol/vol) glycerol/H2O and should be stored at -20°C. Purity is assessed by SDS PAGE analysis. Activity is determined in a clotting assay using factor XI deficient plasma. two apparently identical heavy chains (Mr~50,000) and two apparently identical light chains (Mr~30,000) held together by disulfide bonds. Each light chain contains a catalytic domain (1,3). Kurachi, K., et al., Biochemistry, 19, 1330 (1980). Scott, C.F., et al., J. Clin. Invest., 69, 844 (1982). Heck, L.W. and Kaplan, A.P., J. Exp. Med., 140, 1615 (1974).